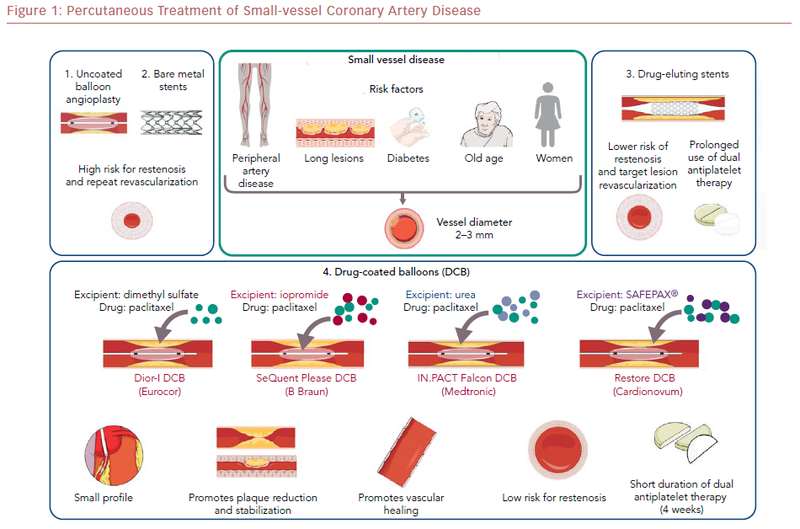 Percutaneous coronary intervention of small-vessel coronary artery disease (SVD) remains challenging due to difficulties with device delivery and high restenosis rate, even with the use of newer-generation drug-eluting stents. Drug-coated balloons represent an attractive emerging percutaneous coronary intervention option in patients with SVD. Potential advantages of drug-coated balloons in SVD include enhanced deliverability because of their small profile, avoidance of foreign-body implantation, and shorter duration of dual antiplatelet therapy. EB: consulting/speaker honoraria from Abbott Vascular, American Heart Association (associate editor, Circulation), Boston Scientific, Cardiovascular Innovations Foundation (Board of Directors), CSI, Elsevier, GE Healthcare, InfraRedx, and Medtronic; research support from Siemens, Regeneron, and Osprey; shareholder MHI Ventures; board of trustees, Society of Cardiovascular Angiography and Interventions. The other authors have have no conflicts of interest to declare. Percutaneous coronary intervention (PCI) of small-vessel coronary artery disease (SVD) is challenging because of difficulties with equipment delivery and high restenosis rates. Drug-coated balloons (DCBs) are an attractive emerging PCI option for patients with SVD. First-generation DCBs (e.g. DIOR-I®, Eurocor) were used in the early feasibility studies, but outcomes improved with newer-generation DCBs.57 The difference in efficacy has been attributed mainly to the absence of a matrix containing an elution excipient. The newer-generation DCBs (e.g. SeQuent Please®, B Braun) have a matrix consisting of an excipient to enhance lipophilicity, increase local tissue–drug transfer, and facilitate rapid absorption of the drug by the vascular wall. The balloon elution excipient is an important factor affecting the safety and efficacy of DCBs, as it determines the durability of drug dose, the downstream drug dose, the relative uptake by the vessel wall, and the drug retention.58 Different excipients are used in newer-generation DCBs; for example, the contrast agent iopromide is used in the SeQuent Please DCB (B Braun), and urea is used in the IN.PACT Falcon DCB (Medtronic). In 2016, Siontis et al. performed a large network meta-analysis of various PCI treatments for SVD.70 A total of 19 randomized clinical trials involving 5,072 patients were included, and the sirolimus-eluting stents were found to be the most effective treatment for reducing subsequent percentage diameter stenosis, followed by paclitaxel-eluting stents, then DCBs. However, both the PICCOLETO and BELLO studies were included, despite their many limitations, as discussed above. Also, none of the trials used second-generation DESs. 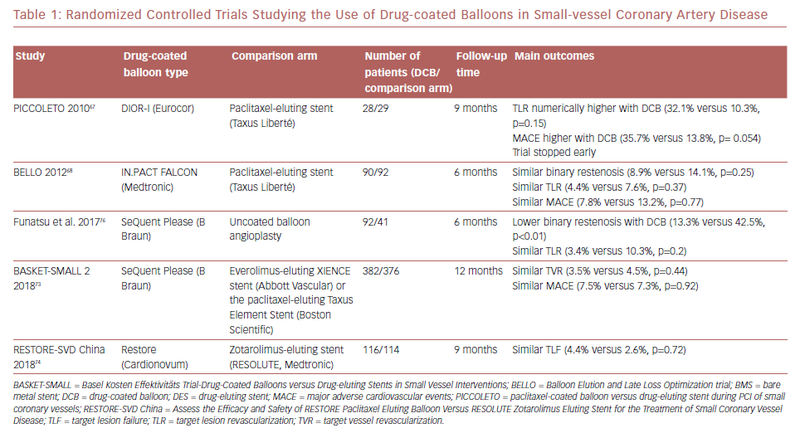 Observational studies were subsequently conducted, showing that DCBs were comparable to second-generation DESs in SVD, even in vessels with a diameter of 2 mm.71,72 The randomized non-inferiority Basel Kosten Effektivitäts Trial–Drug-Coated Balloons versus Drug-Eluting Stents in Small Vessel Interventions 2 (BASKET-SMALL 2) trial was the first and largest trial to compare the use of DCBs and second-generation DES.73 The study randomized 758 patients with SVD (RVD <3 mm) to PCI using the the SeQuent Please DCB or a DES (XIENCE V or Taxus Element). The first-generation Taxus was used in 24% of patients in the DES arm. During 12 months of follow-up, the incidence of MACE was 7.3% versus 7.5% in the DES and DCB arms, respectively (HR 0.97; 95% CI [0.58–1.64], p=0.9180). Most evidence on DCBs was derived from studies of paclitaxel-coated balloons. More recently, the use of sirolimus-coated balloons was reported to have favorable outcomes in 156 patients with SVD enrolled in the single-arm prospective NANOLUTÈ registry.52 At 12 months, the incidence of target lesion revascularization/target vessel revascularization was 2.8%, and the incidence of MACE was 3.8%. The randomized controlled trials studying the outcomes of DCB in SVD are summarized in Table 1. Drug-coated balloons offer an attractive treatment option for patients with SVD due to good deliverability, avoidance of foreign-body implantation, and possibly shorter DAPT duration. Kastrati A, Schomig A, Dirschinger J, et al. A randomized trial comparing stenting with balloon angioplasty in small vessels in patients with symptomatic coronary artery disease. ISAR-SMART Study Investigators. Intracoronary Stenting or Angioplasty for Restenosis Reduction in Small Arteries. Circulation 2000;102:2593–8. Granada JF, Huibregtse BA, Dawkins KD. New stent design for use in small coronary arteries during percutaneous coronary intervention. Med Devices (Auckl) 2010;3:57–66. Nemani L. Small vessel angioplasty. Indian Journal of Cardiovascular Disease in Women 2017;2:111–8. Wong P, Lau KW, Lim YL, Oesterle SN. Stent placement for non-STRESS/BENESTENT lesions: a critical review. Catheter Cardiovasc Interv 2000;51:223–33. Akiyama T, Moussa I, Reimers B, et al. Angiographic and clinical outcome following coronary stenting of small vessels: a comparison with coronary stenting of large vessels. J Am Coll Cardiol 1998;32:1610–8. Solomonica A, Roguin A. Best percutaneous coronary intervention approach for small caliber coronary arteries. J Thorac Dis 2016;8:E1268–70. Al Suwaidi J, Berger PB, Holmes DR Jr. Coronary artery stents. JAMA 2000;284:1828–36. Füssl R, Burkhard-Meier C, et al. Dissection following balloon angioplasty: predictive possibilities using pre-interventional intravascular ultrasonography. Z Kardiol 1995;84:205–15 [in German]. Foley DP, Melkert R, Serruys PW. Influence of coronary vessel size on renarrowing process and late angiographic outcome after successful balloon angioplasty. Circulation 1994;90:1239–51. Elezi S, Kastrati A, Neumann FJ, et al. Vessel size and long-term outcome after coronary stent placement. Circulation 1998;98:1875–80. Serruys PW, Kay IP, Disco C, et al. Periprocedural quantitative coronary angiography after Palmaz-Schatz stent implantation predicts the restenosis rate at six months: results of a meta-analysis of the Belgian Netherlands Stent Study (BENESTENT) I, BENESTENT II pilot, BENESTENT II and MUSIC trials. J Am Coll Cardiol 1999;34:1067–74. Mintz GS. Remodeling and restenosis: observations from serial intravascular ultrasound studies. Curr Interv Cardiol Rep 2000;2:316–25. Agostoni P, Biondi-Zoccai GG, Gasparini GL, et al. Is bare-metal stenting superior to balloon angioplasty for small vessel coronary artery disease? Evidence from a meta-analysis of randomized trials. Eur Heart J 2005;26:881–9. Kirtane AJ, Gupta A, Iyengar S, et al. Safety and efficacy of drug-eluting and bare metal stents: comprehensive meta-analysis of randomized trials and observational studies. Circulation 2009;119:3198–206. Stone GW, Ellis SG, Cox DA, et al. One-year clinical r esults with the slow-release, polymer-based, paclitaxel-eluting TAXUS stent: the TAXUS-IV trial. Circulation 2004;109:1942–7. Stone GW, Ellis SG, Cannon L, et al. Comparison of a polymer-based paclitaxel-eluting stent with a bare metal stent in patients with complex coronary artery disease: a randomized controlled trial. JAMA 2005;294:1215–23. Dawkins KD, Grube E, Guagliumi G, et al. Clinical efficacy of polymer-based paclitaxel-eluting stents in the treatment of complex, long coronary artery lesions from a multicenter, randomized trial: support for the use of drug-eluting stents in contemporary clinical practice. Circulation 2005;112:3306–13. Briguori C, Sarais C, Pagnotta P, et al. In-stent restenosis in small coronary arteries: impact of strut thickness. J Am Coll Cardiol 2002;40:403–9. Giannini F, Latib A, Colombo A. Paclitaxel-eluting balloons or paclitaxel-eluting stents for the treatment of small-vessel coronary artery disease? Interv Cardiol (Lond) 2013;5:137. Maluenda G, Lemesle G, Waksman R. A critical appraisal of the safety and efficacy of drug-eluting stents. Clin Pharmacol Ther 2009;85:474–80. Finn AV, Nakazawa G, Joner M, et al. Vascular responses to drug eluting stents: importance of delayed healing. Arterioscler Thromb Vasc Biol 2007;27:1500–10. Byrne RA, Joner M, Kastrati A. Polymer coatings and delayed arterial healing following drug-eluting stent implantation. Minerva Cardioangiol 2009;57:567–84. Togni M, Windecker S, Cocchia R, et al. Sirolimus-eluting stents associated with paradoxic coronary vasoconstriction. J Am Coll Cardiol 2005;46:231–6. Godino C, Furuichi S, Latib A, et al. Clinical and angiographic follow-up of small vessel lesions treated with paclitaxel-eluting stents (from the TRUE Registry). Am J Cardiol 2008;102:1002–8. Mehilli J, Dibra A, Kastrati A, et al. Randomized trial of paclitaxel- and sirolimus-eluting stents in small coronary vessels. Eur Heart J 2006;27:260–6. Lee CW, Suh J, Lee SW, et al. Factors predictive of cardiac events and restenosis after sirolimus-eluting stent implantation in small coronary arteries. Catheter Cardiovasc Interv 2007;69:821–5. Togni M, Eber S, Widmer J, et al. Impact of vessel size on outcome after implantation of sirolimus-eluting and paclitaxel-eluting stents: a subgroup analysis of the SIRTAX trial. J Am Coll Cardiol 2007;50:1123–31. Machecourt J, Danchin N, Lablanche JM, et al. Risk factors for stent thrombosis after implantation of sirolimus-eluting stents in diabetic and nondiabetic patients: the EVASTENT Matched-Cohort Registry. J Am Coll Cardiol 2007;50:501–8. Bangalore S, Toklu B, Patel N, Feit F, Stone GW. Newer-generation ultrathin strut drug-eluting stents versus older second-generation thicker strut drug-eluting stents for coronary artery disease: meta-analysis of randomized trials. Circulation 2018;138:2216–26. Chitkara K, Gershlick A. Second versus first-generation drug-eluting stents. J Interv Cardiol 2010;5:23–6. Leon MB, Mauri L, Popma JJ, et al. A randomized comparison of the Endeavor zotarolimus-eluting stent versus the TAXUS paclitaxel-eluting stent in de novo native coronary lesions 12–month outcomes from the ENDEAVOR IV trial. J Am Coll Cardiol 2010;55:543–54. Stone GW, Rizvi A, Newman W, et al. Everolimus-eluting versus paclitaxel-eluting stents in coronary artery disease. N Engl J Med 2010;362:1663–74. Wykrzykowska JJ, Serruys PW, Onuma Y, et al. Impact of vessel size on angiographic and clinical outcomes of revascularization with biolimus-eluting stent with biodegradable polymer and sirolimus-eluting stent with durable polymer the LEADERS trial substudy. JACC Cardiovasc Interv 2009;2:861–70. Price MJ, Saito S, Shlofmitz RA, et al. First report of the resolute onyx 2.0-mm zotarolimus-eluting stent for the treatment of coronary lesions with very small reference vessel diameter. JACC Cardiovasc Interv 2017;10:1381–8. Mauri L, Orav EJ, O’Malley AJ, et al. Relationship of late loss in lumen diameter to coronary restenosis in sirolimus-eluting stents. Circulation 2005;111:321–7. Cannon LA, Simon DI, Kereiakes D, et al. The XIENCE nano everolimus eluting coronary stent system for the treatment of small coronary arteries: the SPIRIT Small Vessel trial. Catheter Cardiovasc Interv 2012;80:546–53. Hermiller JB, Rutledge DR, Mao VW, et al. Clinical outcomes in real‐world patients with small vessel disease treated with XIENCE V® everolimus‐eluting stents: one year results from the XIENCE V® USA condition of approval post‐market study. Catheter Cardiovasc Interv 2014;84:7–16. Jeger R, Pfisterer M, Pfister O, et al. First-generation paclitaxel- vs second-generation zotarolimus-eluting stents in small coronary arteries: the BASKET-SMALL Pilot Study. Postepy Kardiol Interwencyjnej 2016;12:314. Jinnouchi H, Kuramitsu S, Shinozaki T, et al. Two‐year clinical outcomes of the NOBORI biolimus‐eluting stents versus XIENCE/PROMUS everolimus‐eluting stents in small vessel disease. Catheter Cardiovasc Interv 2016;88:E132–8. Micari A, Cioppa A, Vadala G, et al. Clinical evaluation of a paclitaxel-eluting balloon for treatment of femoropopliteal arterial disease: 12–month results from a multicenter Italian registry. JACC Cardiovasc Interv 2012;5:331–8. Scheller B, Hehrlein C, Bocksch W, et al. Treatment of coronary in-stent restenosis with a paclitaxel-coated balloon catheter. N Engl J Med 2006;355:2113–24. Cai JZ, Zhu YX, Wang XY, et al. Comparison of new-generation drug-eluting stents versus drug-coated balloon for in-stent restenosis: a meta-analysis of randomised controlled trials. BMJ Open 2018;8(2):e017231. Stella PR, Belkacemi A, Waksman R, et al. The Valentines Trial: results of the first one week worldwide multicentre enrolment trial, evaluating the real world usage of the second generation DIOR paclitaxel drug-eluting balloon for in-stent restenosis treatment. EuroIntervention 2011;7:705–10. Windecker S, Kolh P, Alfonso F, et al. 2014 ESC/EACTS guidelines on myocardial revascularization: the Task Force on Myocardial Revascularization of the European Society of Cardiology (ESC) and the European Association for Cardio-Thoracic Surgery (EACTS) developed with the special contribution of the European Association of Percutaneous Cardiovascular Interventions (EAPCI). EuroIntervention 2015;10:1024–94. Waksman R, Serra A, Loh JP, et al. Drug-coated balloons for de novo coronary lesions: results from the Valentines II trial. EuroIntervention 2013;9:613–9. Kleber FX, Schulz A, Waliszewski M, et al. Local paclitaxel induces late lumen enlargement in coronary arteries after balloon angioplasty. Clin Res Cardiol 2015;104:217–25. Liu L, Liu B, Ren J, et al. Comparison of drug-eluting balloon versus drug-eluting stent for treatment of coronary artery disease: a meta-analysis of randomized controlled trials. BMC Cardiovasc Disord 2018;18:46. Belkacemi A, Agostoni P, Nathoe HM, et al. First results of the DEB-AMI (drug eluting balloon in acute ST-segment elevation myocardial infarction) trial: a multicenter randomized comparison of drug-eluting balloon plus bare-metal stent versus bare-metal stent versus drug-eluting stent in primary percutaneous coronary intervention with 6–month angiographic, intravascular, functional, and clinical outcomes. J Am Coll Cardiol 2012;59:2327–37. Cortese B, Dani S, Parikh K, et al. TCTAP A-041 Safety and efficacy of sirolimus coated balloon for the treatment of coronary small vessel disease: results from Real World Multicenter Study. J Am Coll Cardiol 2017;69:S20. Parikh KH, Parikh P, Bhatt P, et al. Real world clinical outcomes of sirolimus coated balloon in coronary artery lesions: results from single centre study. J Am Coll Cardiol 2018;71:A1112. Speck U, Stolzenburg N, Peters D, Scheller B. How does a drug-coated balloon work? Overview of coating technologies and their impact. J Cardiovasc Surg (Torino) 2016;57:3–11. Bukka M, Rednam PJ, Sinha M. Drug-eluting balloon: design, technology and clinical aspects. Biomed Mater 2018;13:032001. Neumann FJ, Sousa-Uva M, Ahlsson A, et al. 2018 ESC/EACTS guidelines on myocardial revascularization. Eur Heart J 2019;40:87–165. Bondesson P, Lagerqvist B, James SK, et al. Comparison of two drug-eluting balloons: a report from the SCAAR registry. EuroIntervention 2012;8:444–9. Rosenfield K, Duda S. Defining the next generation of drug-coated balloon technology. Endovascular Today September 2010. Available at: https://evtoday.com/2010/09/defining-the-next-generation-of-drug-coated-... (accessed February 5, 2019). Kleber F, Scheller B, Ong P, et al. TCT-776 Duration of dual antiplatelet therapy after drug-coated balloon implantation. J Am Coll Cardiol 2018;72:B309–10. Richelsen RK, Overvad TF, Jensen SE. Drug-eluting balloons in the treatment of coronary de novo lesions: a comprehensive review. Cardiol Ther 2016;5:133–60. Ann SH, Balbir Singh G, Lim KH, et al. Anatomical and physiological changes after paclitaxel-coated balloon for atherosclerotic de novo coronary lesions: serial IVUS-VH and FFR study. PLoS One 2016;11:e0147057. Patel S, Svermova T, Burke-Gaffney A, Bogle RG. 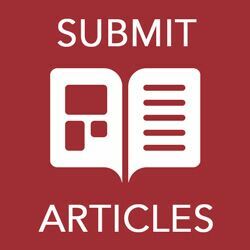 Drug-eluting balloons with provisional bail-out or adjunctive stenting in de novo coronary artery lesions – a systematic review and meta-analysis. Cardiovasc Diagn Ther 2018;8:121–36. Unverdorben M, Kleber FX, Heuer H, et al. Treatment of small coronary arteries with a paclitaxel-coated balloon catheter. Clin Res Cardiol 2010;99:165–74. Benezet J, Gutierrez-Barrios A, Agarrado A, et al. Paclitaxel-coated balloon angioplasty for de novo coronary lesions: a long-term follow-up study. Minerva Cardioangiol 2016;64:15–22. Unverdorben M, Kleber FX, Heuer H, et al. Treatment of small coronary arteries with a paclitaxel-coated balloon catheter in the PEPCAD I study: are lesions clinically stable from 12 to 36 months? EuroIntervention 2013;9:620–8. Vaquerizo B, Miranda-Guardiola F, Fernandez E, et al. Treatment of small vessel disease with the paclitaxel drug-eluting balloon: 6–month angiographic and 1–year clinical outcomes of the Spanish Multicenter Registry. J Interv Cardiol 2015;28:430–8. Cortese B, Micheli A, Picchi A, et al. Paclitaxel-coated balloon versus drug-eluting stent during PCI of small coronary vessels, a prospective randomised clinical trial. The PICCOLETO study. Heart 2010;96:1291–6. Latib A, Colombo A, Castriota F, et al. A randomized multicenter study comparing a paclitaxel drug-eluting balloon with a paclitaxel-eluting stent in small coronary vessels: the BELLO (Balloon Elution and Late Loss Optimization) study. J Am Coll Cardiol 2012;60:2473–80. Latib A, Ruparelia N, Menozzi A, et al. 3–year follow-up of the Balloon Elution and Late Loss Optimization study (BELLO). JACC Cardiovasc Interv 2015;8:1132–4. Siontis GC, Piccolo R, Praz F, et al. Percutaneous coronary interventions for the treatment of stenoses in small coronary arteries: a network meta-analysis. JACC Cardiovasc Interv 2016;9:1324–34. Sim H, Ananthakrishna R, Chan S, et al. Treatment of very small de novo coronary artery disease with 2.0 mm drug-coated balloons showed 1–year clinical outcome comparable with 2.0 mm drug-eluting stents. J Invasive Cardiol 2018;30(7):256–61. Sinaga DA, Ho HH, Watson TJ, et al. Drug-coated balloons: a safe and effective alternative to drug-eluting stents in small vessel coronary artery disease. J Interv Cardiol 2016;29:454–60. Jeger RV, Farah A, Ohlow MA, et al. Drug-coated balloons for small coronary artery disease (BASKET-SMALL 2): an open-label randomised non-inferiority trial. Lancet 2018;392:849–56. Tang Y, Qiao S, Su X, et al. Drug-coated balloon versus drug-eluting stent for small-vessel disease: the RESTORE SVD china randomized trial. JACC Cardiovasc Interv 2018;11:2381–92. Megaly M, Rofael M, Saad M, et al. Outcomes with drug-coated balloons in small-vessel coronary artery disease. Catheter Cardiovasc Interv 2018;November 29. Funatsu A, Nakamura S, Inoue N, et al. A multicenter randomized comparison of paclitaxel-coated balloon with plain balloon angioplasty in patients with small vessel disease. Clin Res Cardiol 2017;106:824–32.